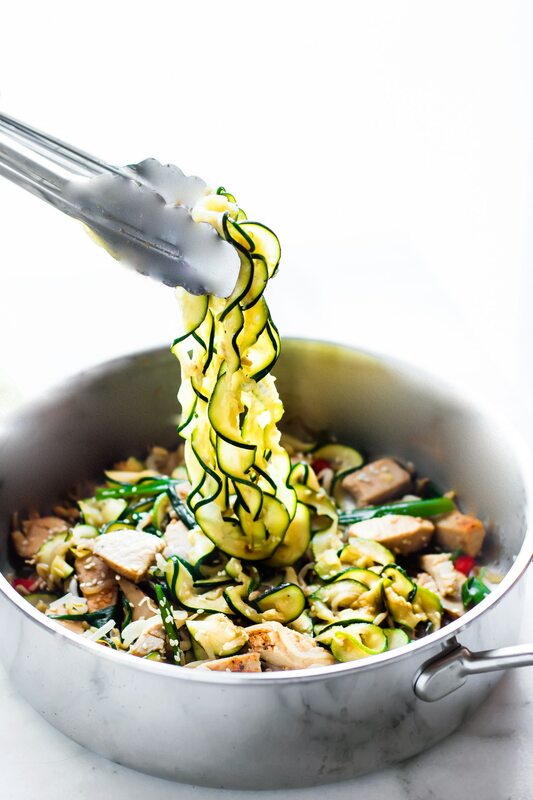 Turkey Chow Fun Zoodles Stir Fry is made with stir fry zucchini noodles plus holiday leftover turkey and veggies! 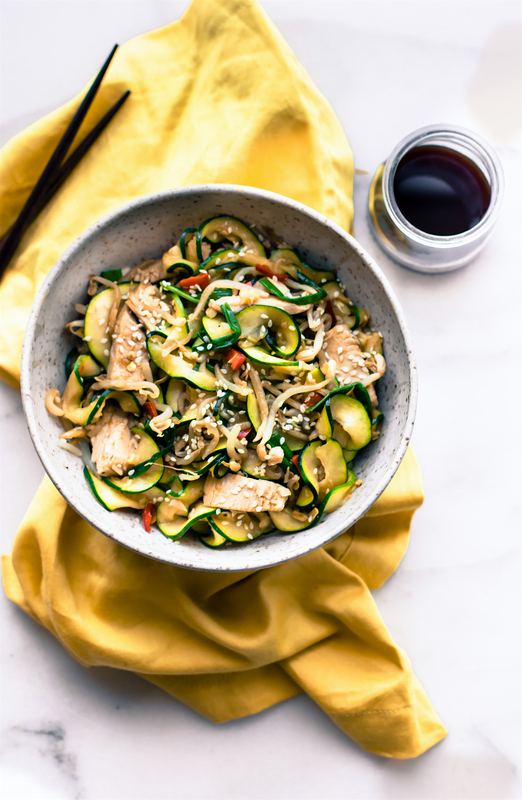 This spiralized zucchini noodles stir fry recipe is light, naturally gluten free, and lower in carbs. This healthier chow fun is an easy low carb dinner recipe and it is SO delicious! 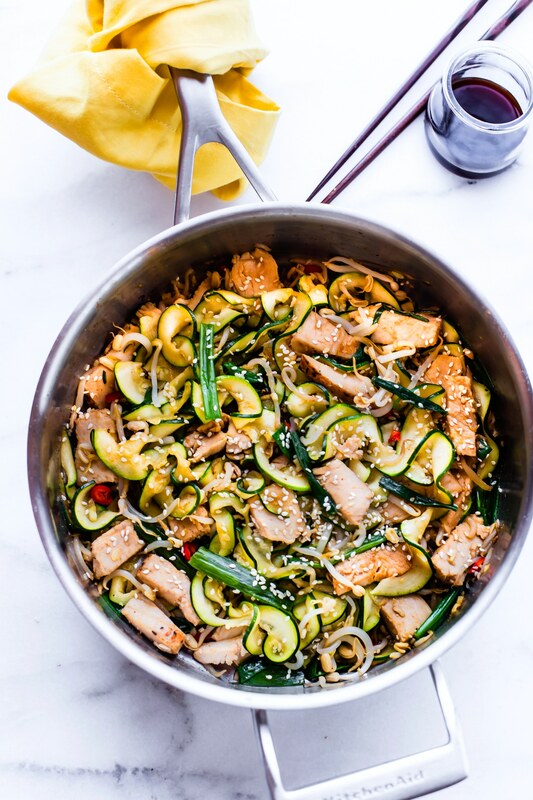 This Tamari Turkey Chow Fun Zoodles Stir Fry recipe is sponsored by my friends over at San-J. Thank you for allowing me to talk about their quality Tamari Sauce. All opinions are my own, always. Get ready to have some Friday fun! Turkey CHOW FUN! Hey friends! Hope you had a wonderful Thanksgiving! Are you stuffed? Nah, you’re ready for all the leftovers! Best part if you ask me. You all know we (the Cotters) aren’t too crazy about plain roasted turkey. But using turkey leftovers in recipes, for sure! Which is why I’m obsessed with Turkey Paleo chili, turkey cobb salad , and now this turkey chow fun tamari zoodles recipe! It’s my new favorite Asian inspired leftover turkey recipe! Super easy to make, light, lower in carbs, gluten free, and oh so tasty. Plus I get to use one of my absolute favorite stir-fry making ingredients; Tamari! Yes, Tamari and Turkey and zucchini noodles (aka zoodles), oh what fun! Haha, pun intended. So before I dive into this turkey chow fun Tamari zoodle recipe, let’s talk a little bit about Tamari sauces, mmm k? You’ll love knowing what makes this gluten free Asian sauce super duper special, and healthy. For starters, San-J Tamari is a great gluten free soy sauce. San-J Tamari is definitely a staple in our house; for stir fry recipes and more. But more importantly, San-J Tamari is a better quality Asian gluten free soy sauce. Let me explain this awesome sauce! You see, San-J’s Tamari is made with Japanese brewing methods handed down through eight generations. Meaning, the soybeans are fermented for up to 6 months! Yep, pretty amazing! 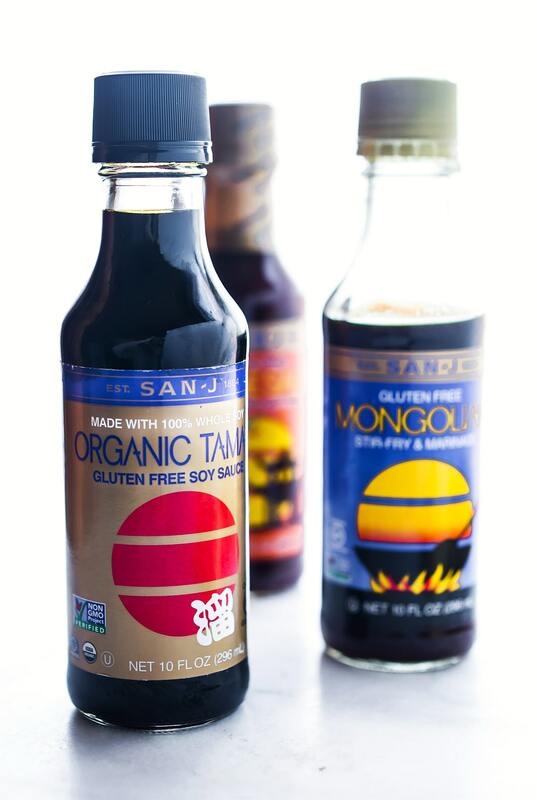 San-J uses only quality non-gmo ingredients including soybeans to make their Tamari Soy Sauce. It is also certified vegan, gluten free, and free of artificial preservatives, flavors, or colors. Oh I so love that! Regular soy sauce contains both soy/wheat and can be flashed until higher temperature, which degrades the quality and taste. Make sense? San-J Tamari is made with 100% soy and no wheat so the higher concentration of soy protein makes the taste richer, smoother and more flavorful. Which is why it pairs so nicely in veggie stir fry dishes. I’ve also used tamari in salads, dressings, and marinades. Can you tell we love tamari? Oh yea! You’re a food science enthusiast like me, you’ll love learning more about the history of San-J Tamari and their brewing process here. Back to my objective here; holiday leftovers. 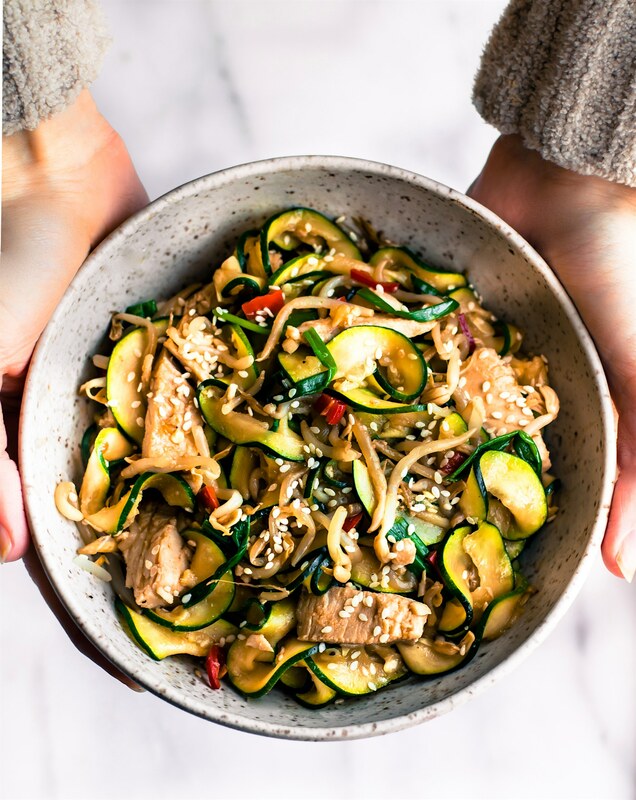 What better way to nourish your body while tackling those thanksgiving leftovers than with this naturally gluten free Turkey Chow Fun zucchini stir fry recipe, made with tamari sauce?! Excuse the run on sentence, but I get excited! Ya’ll, this dish is light and tasty! The best of both worlds. It’s also incredibly EASY to make. 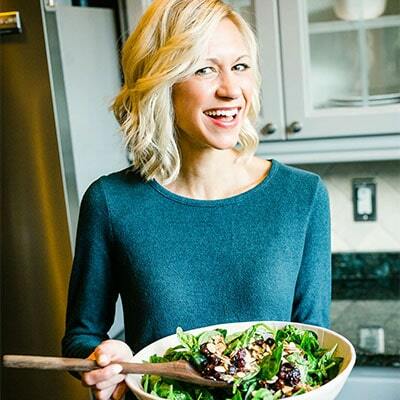 I’m thinking you need an easy recipe after a week of holiday meal prep and festivities. What vegetables can you zoodle? The list goes on… just use your imagination and grab those raw veggies from the fridge! That being said, let’s get the recipe. 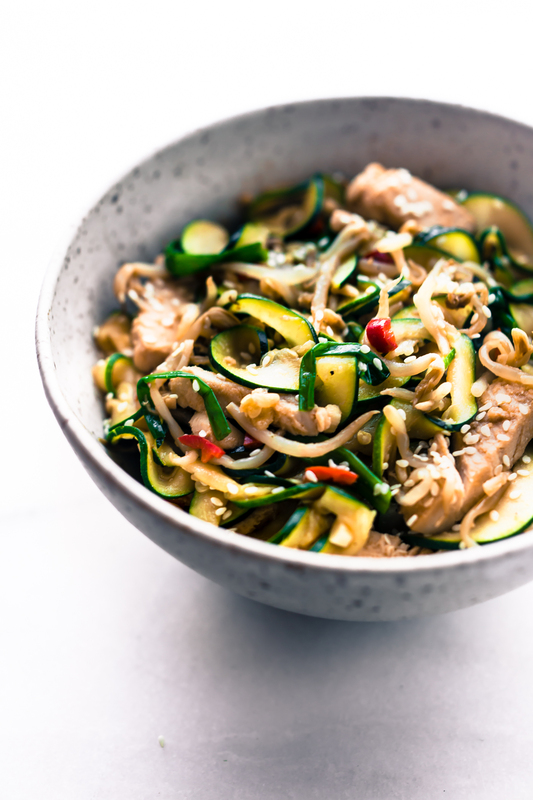 A Turkey Chow Fun zucchini stir fry recipe made with tamari zucchini noodles! This healthier chow fun stir fry is light, naturally gluten free, and lower in carbs. A chow fun recipe that puts those leftover veggies and turkey to use. Spiralize the zucchini and pat dry with paper towel. Make sure to get out as much moisture as possible. If you don’t have a spiralizer, you can julienne cut or peel into strips. Add oil and 1 garlic to stir fry pan. Let it bubble and become fragrant 1 minute. Cook 1-2 minutes, longer if meat is uncooked. Add your zucchini noodles and the other ½ of sauce. Toss meat with tongs on high for 2-4 minutes. Drain extra sauce but reserve ¼ to 1/3 cup sauce to serve on top of noodles. Top with sesame and chili flakes to garnish. (Feel free to add these in the pot before serving as well). Add your reserved sauce to each bowl if desired. If you don’t have zucchini, feel free to use another veggie to spiralize for the noodles. Squash, potato, sweet potato, etc. Nutrition is estimated, per bowl. 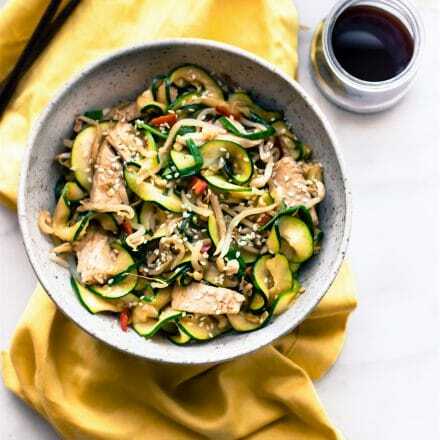 This turkey chow fun zoodles stir fry recipe is a keeper, even after the holidays. It can feed the family or you can make it just for one. Great for lunches, meal plan recipe, or whenever you feel like homemade takeout! Sure does come in handy when you want to clean up your meals but keep the taste. Ya know? Oh I know you know! If you are looking for a great spiralizer to make zucchini stir fry noodles (or ANY spiralized veggies) I bought mine on Amazon (Affiliate link, just FYI). It has 5 blades which makes all kinds of different noodles shapes, including a wider/flat noodle shape similar to that of chow fun rice noodles, pictured above. 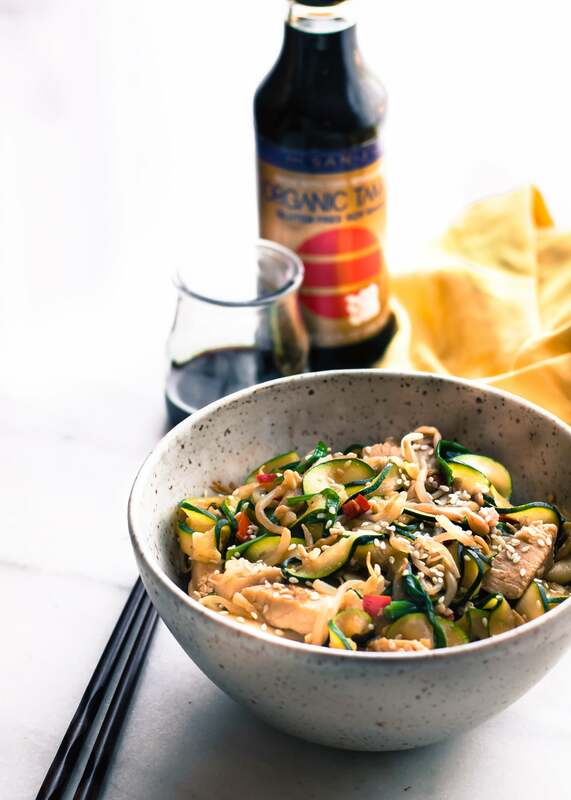 Grab some chop sticks and dig in to the stir fry zucchini noodles! Heck, just grab the bowl and slurp. Totally allowed! Keep up with San-J on social media. 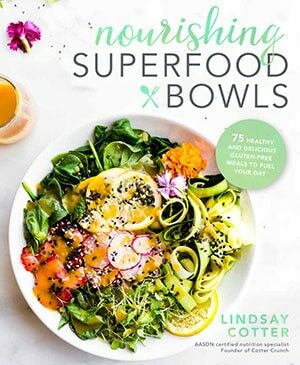 They are full of gluten free and Asian Inspired recipes! Facebook, Pinterest, and Twitter. What’s your favorite leftover Turkey recipe? Ever tried Tamari Soy Sauce? Now’s the perfect time! Yum! I love a good tamari sauce and Zoodles are just a staple at this point. Must try this! for sure. I don’t know what i’d do with a good stir fry recipe or zoodles! Love me some Tamari. I don’t think I’ll ever eat again, however… at least for another hour..
Ohhhh this looks so good. I love tamari and I bet it goes perfectly with some zoodles. As a southerner who hates southern food… I LOVE this idea! Asian is always a win in my house. So is chips, salsa, and wine… which is what’s happening now. same. I’ll take lamb or thai or asian over traditional turkey and stuffing any day! LOL! Yes to all of the above!! San-J low sodium tamari is the only kind of tamari (or gluten-free soy sauce sub) that I use and I love it – it’s one of my pantry staples that I’m never without. This recipe looks totally divine and I <3 zucchini noodles. Can't wait to give it a try. Happy (belated) Thanskgiving, friend! What a fun idea to use zucchini noodles! Great way t pack in more veggie goodness! Yes, leftovers are the best part to me and San-J Tamari is an awesome sauce in my book too! We agree on so much…hehe!! Another thing we agree on is that I REALLY need to make this gluten free Turkey Chow Fun Tamari zoodles! I’m ready to face-plant into a big bowl…just sayin’! I love this brand of Tamari. It’s the only one that I buy! I also love that no one can tell the difference between tamari or soy sauce in my family 😉 And while I’ve never tried turkey in a stir-fry before – this recipe looks and sounds amazing! I’m a sucker for anything made with zoodles! isn’t it the best? LOVE san-j! I’ve never heard the term turkey chow before, clearly I need to cook more. 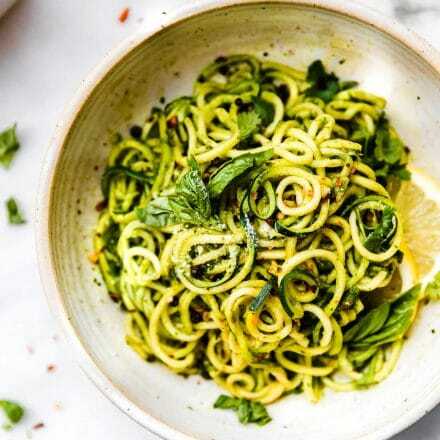 Looks fabulous, i’m all about the zoodles!! you mean chow fun? You’ve never heard of it? Oh you must try! 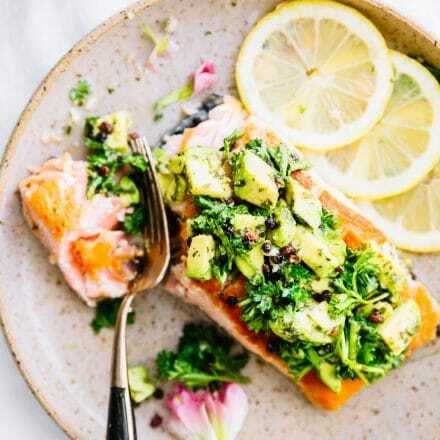 Such a great way to use leftovers, it looks so fresh and flavorful! Those zoodles have be drooling. You know, i’ve still yet to have zoodles, but these look incredible. I may have to give them a try! Gorgeous photos! I want to take a bite out of my screen! Thanks for the delicious looking recipe. I’m gonna have to give it a try! I love making turkey and cranberry sauce grilled cheese sandwiches! But there are only so many days after thanksgiving I can handle the same thing. So this is perfect! oh i gotta try your sandwich next! YUM! Well this looks delightful! I wish I would have seen this before I whipped up 10 containers of soup lol! I am going to have to whip this up with some of my chicken breast- it looks to good to pass up! haha well maybe chow fun noodle soup is next! yes? Your pictures of this recipe are very inspiring! I have a spiralizer as well and this would be a perfect recipe to try using it! you must try! i think you’ll love! I can’t stop thinking about this noodle dish. I want to eat it everyday. It actually is! I saw the pic on your FB page and was instantly thinking about it. Looks so good and we are eating mostly Paleo meals right now. Delish! haha yay! i love that. What a great idea! And nice, healthier use for leftovers. I need this! This looks SOOO good. I really need to get a spiralizer in my life–your recipes always make me want one. 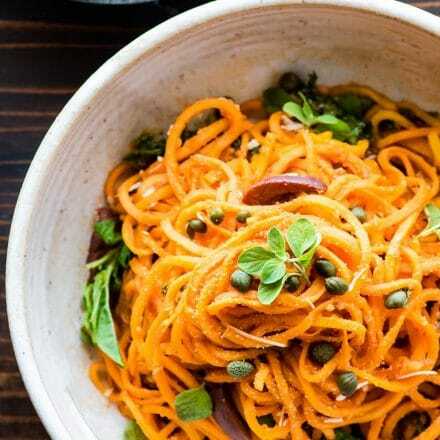 oh you so need a spiralizer! I adore mine. Seriously Lindsay, you could open a restaurant with all of the beautiful meals you create! Haha, that would be a lot of work. But I do like to cook! This looks amazing!! Such a great way to use up leftovers. San-J is my go-to brand for tamari. It’s so good!! I love the idea of making a stir fry using leftover turkey. And look at those colors! Its’s so pretty! Such a beautiful recipe! 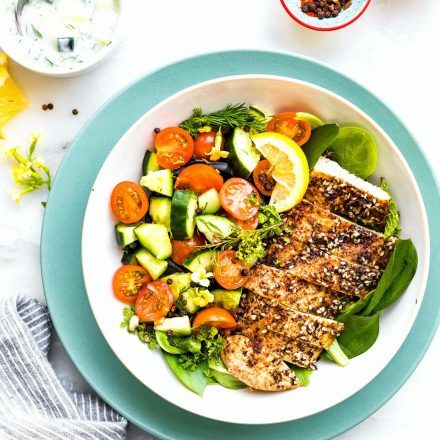 It looks perfect for a quick and easy dinner! I love spiraled zucchini! What a beautiful recipe! This sounds fantastic! I love the way you did your zoodles! You’d so love this meg! WOWZA! Need to try this ASAP! Very true! I meant to write that note in. I’ll update the recipe for garlic infused oil. Thank you Karen!